I know, I know. What's the point of a blog poll if you stop updating the question?! It seems that after the last poll (created shortly after Hurricane Ike hit here in Texas) the poll fell off my radar, so it is with great pleasure that I "re-open" the polls and re-commit to running new polls every couple of weeks. And we're getting started with a fun one! About a year ago, I asked you a simple question: Which .NET language do you use primarily use when programming? 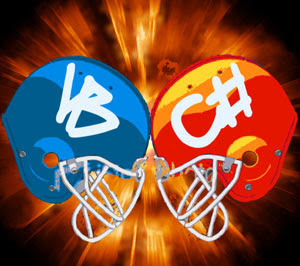 As expected, most respondents answered either VB or C#, with C# "slightly" edging-out VB's popularity 63% to 34%. In isolation, the results really don't mean much, though. What makes me curious is the trend. In other words, is interest in one language increasing while interest in another is declining? Is interest remaining flat? So this year's ".NET Language Survey" is really going to be interesting since we'll finally have two data points and we can start to define our trend. To make your voice heard, vote now (poll is on right side of the Telerik Watch landing page)! You've got two weeks to vote before the polls close. Which language will reign supreme? We'll find out in a couple weeks. P.S. For those of you looking for a summary of the last poll, it will be coming very soon. Stay tuned. I was just curious. Is it a matter of preference or is there something (or anything) that you can do in one and can't do it in other? @Asit- These days, it's mostly preference, but there are still some things that one language does "more efficiently" than the other (auto props in C#3, for example, and VB's handling of XML or Optional Params). I think VB is better for learning because of syntax, but C# is best on the long run because I can see 'code structure' and 'conditions' with an eye blink. A good example is when I see live demos (ex: TechDays), if it is in VB there is text and text and text (you got to read to see structure) and it is difficult to read compared to C#. @Dave - This is brilliant. Thx. i wanna vote for c#! how do i cast my vote? @Jett - Well, official voting is closed, but consider your vote noted!